Queen of the Hospital Garden Castle! Staying an extra day didn’t really “help” anything, but I feel better about going home now. She still threw up with both feeds yesterday evening, and they went ahead and started her Zofran, so at least we are coming home with that to help lessen her vomitting. She’s still getting in pain every 4 hours. At about hour 3 – 3 1/2, she starts moaning, then it turns to inconsolible crying. About 10 minutes after getting her pain meds, she’s happy as a Momma eatin’ chocolate. They did up the dose a bit yesterday. It helped a little anyway. Annabelle and I had a good evening yesterday! Daddy came and stayed the night, so that was fun! He’s working at a job up North of Nashville today, so he was able to just to leave this morning and go straight there, so it worked out. 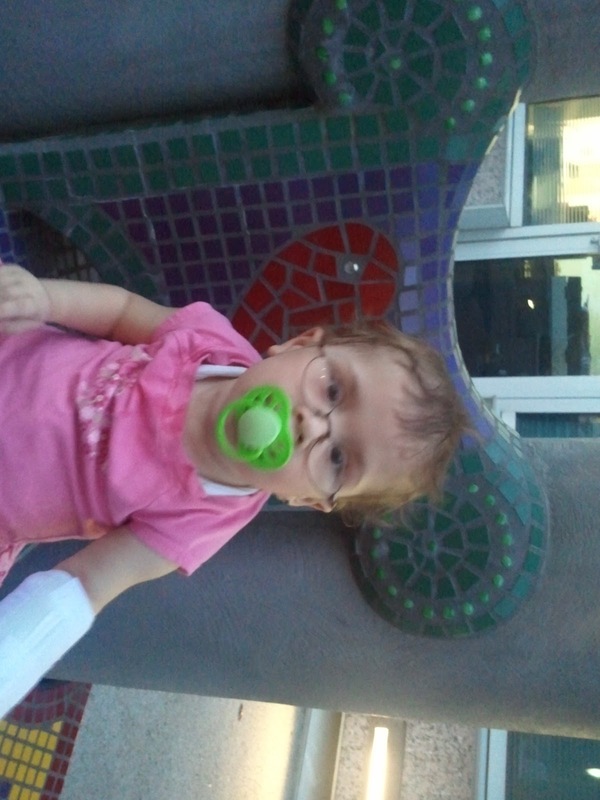 We also went to the outside garden on the 6th floor and Annabelle had a fabulous time walking all around! I was worried that she wouldn’t be so all about walking after surgery for a little while… I was very very wrong. She was like, “GET ME OUT OF HERE, I want to GO!” We did laps around the “pod” several times during the day, but being able to just explore in the garden really did her some good. She was SO tuckered out by the time we got back though, but she slept fairly well, only fussed when it was time for pain meds. Which means Mommy finally got a few hours of sleep too! Yeah!!! I also got to visit with fellow heart-momma friend, Diane, Jude’s Mommy. He’s hoping to get “sprung” from the hospital today too! I’ve updated our “hospital stay” ticker on the side… She’s now up to 353 days now. I’m also super excited to announce that in approximately 7 days, Annabelle will finally hit the mark where she’ll have been at HOME more days than in the HOSPITAL. AND!!!!! I know, could there be even more?? Today is a special day for ANOTHER reason too! Annabelle turns 23 months old today!!!!! So please join me in wishing Annabelle a very happy “birthday”… and a happy GO HOME DAY! Okay, gotta go get ready now…. hoping to get out of here as soon as possible!!!! None of this 2 pm stuff today, I wanna go home and see my other three precious little girls, and Annabelle wants to see her sisters and grandma and grandpa! That sounds like great news! Hoping with you that you're out as soon as possible. And congratualtions to Annabelle for turning 23 months! Hooray!!!!! So glad to hear you're coming home. I can't believe Annabelle is almost two years old!!! Happy Belated 23 months B-day, Annabelle! Glad it is also "Going Home Day", too! And, "HOORAY" for the fast approaching milestone of being home longer than in the hospital! Annabelle is such a trooper! So is her mommy! Hang in there girls. Prayers continue to come your way.